It is pretty obvious that “Director” Kevin Stanfield of the Division of Florida Condominiums, Timeshares, and Mobile Homes and his newest sidekick, “Chief Arbitrator” Caitlin Mawn are out to hurt Florida’s condo owners. Their actions and rulings clearly leave no other explanation. It is absolutely disgusting what comes out of the Division in the moment and leaves the question: Why should Florida’s condo owners continue to pay the salaries of these absolutely useless individuals. The latest ruling of “Chief Arbitrator” Caitlin Mawn is again showing that this lady was appointed to a job she obviously doesn’t have the knowledge to deal with. Before starting such a job she should have miniumum tried to read – not sure she can? 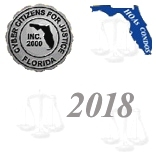 – Florida Statutes 718, Florida Administrative Code 61B-15 Through 25, 45 and 50 and prior arbitration rulings. If she would have attempted to read these rules and laws she wouldn’t have come up – again – with a ruling that rewarded the folks that violated about every recall rule in the book and harmed the owners who in reality produced a correct recall and should be the rightful board members at this moment. It is absolutely ridiculous to come up with such a FINAL RULING as in the case “Bruce Rubino, Unit Owner Representative v. Island Inn Condominium Association, Inc.”. Since 2004, when the HOA TASKFORCE – I was a member of that Task Force -- included the recall provisions into FS 720 (HOA ACT) the failure of the board to hold the required recall board meeting five business days after serve of the recall petitions, was considered to be “deemed effective immediate” – as stated in FAC 61B-23.0027. (a) The recall shall be deemed effective immediately upon expiration of the last day of five full business days after adjournment of the unit owner recall meeting. Since more than a decade it was common practice that the representative for the owners voting for recall filed for arbitration if the board ignored to hold the recall meeting as required by statutes. An arbitrator then officially certified the recall if the recall was facially “valid”. Not so Caitlin Maws, appointed recently as the new Chief Arbitrator. In my opinion she must have won her law degree on the county fair. Otherwise I can’t find any other explanation why she continues to ignore the laws and the rules and comes up with her personal “interpretations” of the laws in place since more than a decade. In this case the “recalled” board” used the old trick arbitrators have laughed about numerous times. The recalled board members quickly resigned, leaving one board member in place who quickly appointed some of their “buddies” to the board. We have seen this attempt of circumventing the laws many times before. But all these attempts ended in a defeat for the recalled board. Caitlin Maws, in her FINAL RULING, claimed that the Owners Voting for Recall failed to send the former board a “warning” that they would file for arbitration. This is an absolutely ridiculous requirement since the former board clearly violated every recall law and rule in the book – and this Chief Arbitrator let them get away with it. Since Kevin Stanfield took over the Division the service of this agency is steadily declining – and is doing more harm than good. It reached a new low with the appointment of this “Chief Arbitrator”. In my opinion government employees like Kevin Stanfield and Caitlin Maws should be instantly fired from their jobs instead of collecting salaries paid for by the people they are in my opinion intentionally harming. This disaster for Florida condo owners has to stop – and it has to be stopped by our elected officials who are responsible for the appointment of such incompetent employees. Why do we have legislators if they allow government workers to ignore the laws and rules they created – and make up their own rules instead?